Chiropractic at the Lighthouse opened in 2009, a year following Dr. Laurelyn Barnett’s graduation from Life University in Atlanta. She loves using chiropractic to help her patients get relief from pain and experience a better quality of life. We believe that chiropractic care is a vital part of any health program. Although many of our patients begin care to get out of pain, they usually choose to continue maintenance and wellness care long after the original problem is gone. Like brushing your teeth to prevent cavities, regular chiropractic adjustments help to prevent excessive degeneration in the spine keeping the electrical nervous system clear. When your body works the way nature intended, your spirit soars —and so do you. You may have experienced a clinical feel lacking that warmth, comfort and familiarity that can be so reassuring when seeking health care. At Chiropractic at the Lighthouse LLC, we have a different kind of office! You will always enjoy a very comfortable and tranquil environment. You will never feel pressured to sign up for certain treatments, and you’ll never feel rushed. Our delivery of care is very relaxed; it’s not a “come in, come out” hurried approach. 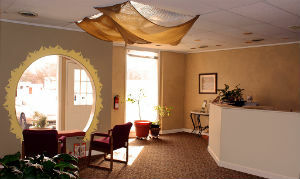 We take as much time as you need to feel at home and to understand the care you’ll receive. We care for patients of all ages. Dr. Barnett explains, “I do the best with people who are scared of the chiropractor and who have tried a bunch of other things except chiropractic. This is their last stop before they have surgery.” Regardless of your health concern, we’re here to offer you hope and let you know we can help! The most fulfilling part of chiropractic is seeing the “miracles,” seeing patients feel better, and being happy along with them as they experience healing. Ready to experience natural healing and optimal health? Call (770) 971-8115 today to schedule an appointment.